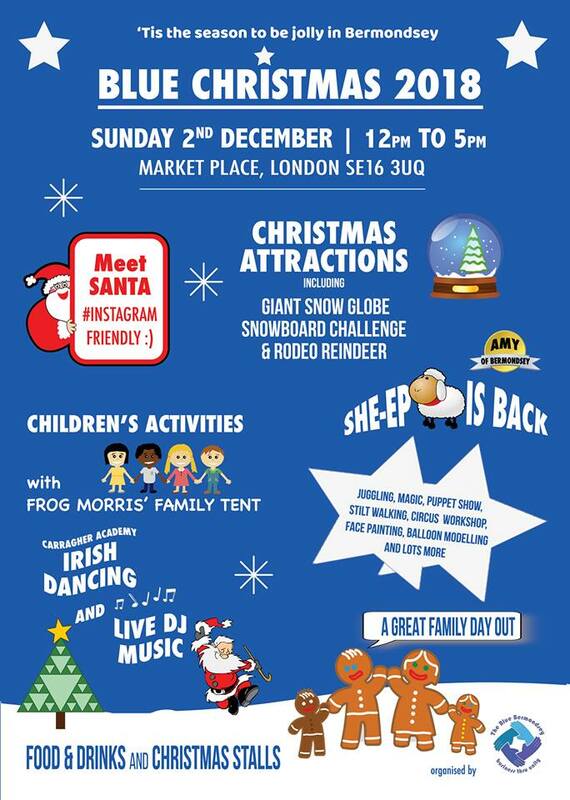 Join The Blue Bermondsey Community in this free Christmas event on Sunday 2nd December from 12pm – 5pm. There will be food and drink, market stalls with a range of crafts and gifts ideal for Christmas, roasted chestnuts, mulled wine and more. Visit Santa and have a photo taken with him and the elves. Other activities include: fire juggling, stilt walking, face painting, glitter tattoos, circus workshop and puppet theatre. Entry is free, some activities may require tokens. Please see their flyer. Please join the Yalding Healthy Living Centre (Age UK) for a Christmas dinner between 1 and 4pm. The flyer can be found here. Please join the Yalding Healthy Living Centre (Age UK) for a Christmas Cake Bake between 10am and 1.30pm. The flyer can be found here. For further information, please call 0207 237 0860. 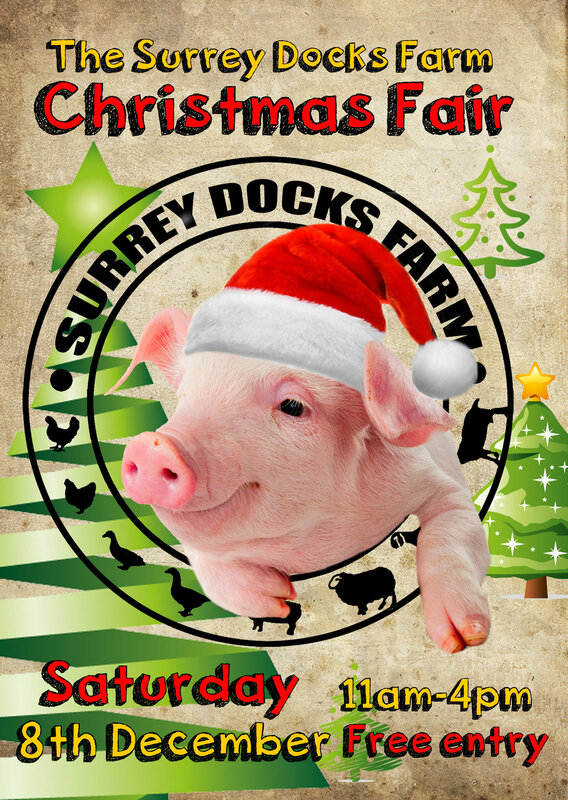 Surrey Docks Farm is a working community farm that aims to educate local people about where their food comes from and promotes getting active outdoors. They have all the usual farm animals, as well as food-growing gardens. Open 7 days a week, 10am – 4pm. Entry is free. 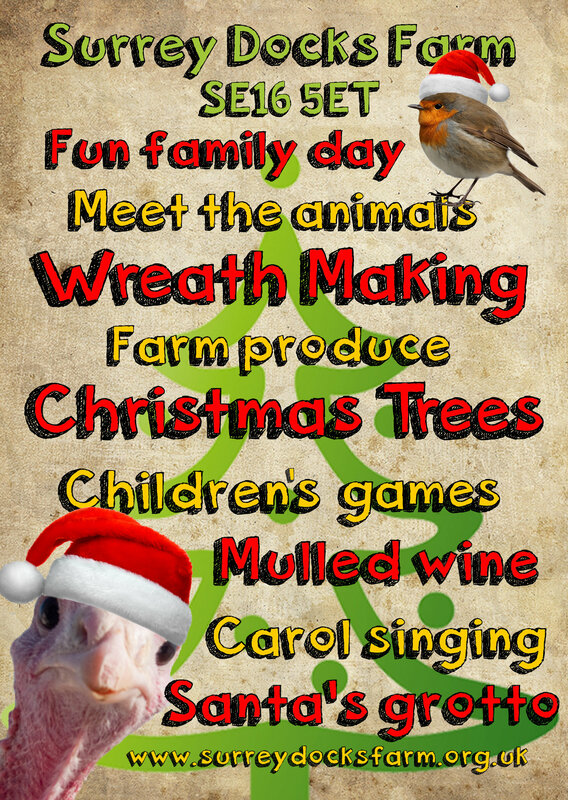 Please see the flyer for their Christmas fair here and activities here. The fair is open 11am – 4pm and entry is free. Like the radio show of its namesake, come with a song in mind and why it’s meaningful to you, or just listen, dance and enjoy the atmosphere! This month’s theme is ‘Festive Tunes’. Please call 0207 118 0404 to say you’re going! The evening will run from 6.30 – 8pm and is hosted by South London Cares. This event is free to attend. 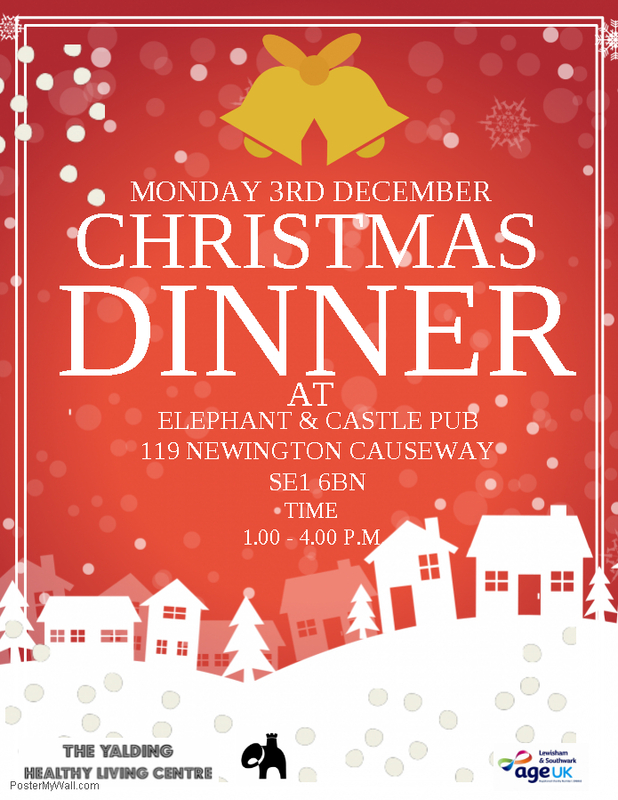 For further Christmas events being hosted by South London Cares, please click here. Head along to Pembroke House from 1 – 3.15pm for the South London Cares Winter Party! Come in your finest festive themed dress (prizes for the best outfits) to celebrate the season of goodwill. Expect dancing, music and entertainment. Please bring a dish, if you can! Call 0207 118 0404 to let us know you’re coming. This event is free to attend. Don your best 1950s clobber and get grooving, or just sit back and enjoy the music. Please call 0207 118 0404 to say you’ll be attending. The dance will run from 6.30 – 8.30pm by South London Cares and is free to attend. 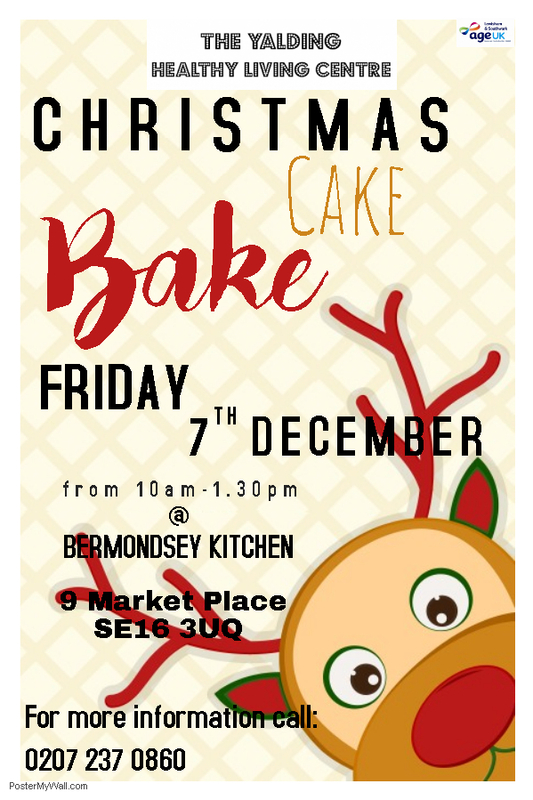 Bermondsey Care for the Elderly’s Christmas Day Party! If you are a pensioner living in north Southwark (postal code SE16, SE1) and would like to join us on Christmas Day then please call Coral/Toni at the Beormund Centre on 020 7237 9313 or email. Closing date is Friday 7th December. Transport is provided and you will recieved a 3-course Christmas lunch, Christmas tea, professional entertainment and goodies throughout the day. Christmas parcel and £5 to go home with. Invitations are on a first-come-first-served basis. Doors open at 11am and there will be a free raffle and an entertainer! For dinner, guests will enjoy traditional turkey with all the trimmings (or lamb as an alternative). There are vegetarian, Caribbean, Asian, diabetic and liquidised alternatives, if you prefer. There’ll also be Christmas pudding to follow! You’ll also recieve a small glass of port, Stilton and biscuits to round off the meal. A light tea in a takeaway box and grocery voucher will also be available so you can choose something to have in the next few days. People Care Association provides free transport to and from the venue, for any guests living in Southwark – and can cater for those with wheelchairs and disabilities. You will need to give plenty of notice if you require transport. The deadline for booking is Sunday 16th December. If you live in Southwark, book your place by filling out the booking form or calling 0203 355 2619. To find out how to refer a Southwark resident for free transport, please click here.